For some travelers, like me, a gastronomic journey is often an attempt to find both, the old AND the new…even to combine them! And that is why I wish that a restaurant like Congdu, nestled in the heart of Seoul, South Korea’s capital city, had conceptual counterparts in great eating cities all over the world. Seoul has its own special dynamic. 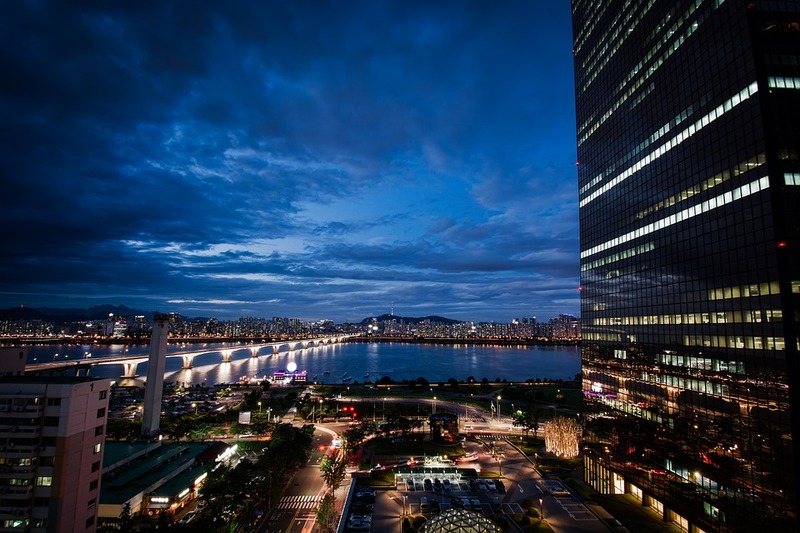 Though its roots go back thousands of years, it feels like a new city—its 13 million inhabitants exploding from gleaming conurbations, one after the other, lining the twenty-mile expressway from the city center to the airport at Incheon. To visit Seoul today feels like a thrust into a modernity that’s concretizing all around you, on the ground of a very old place. The gastronomic implications are clear, and favorable to travelers like me: much of the “old Seoul” remains, just now entering the throes of conversion. 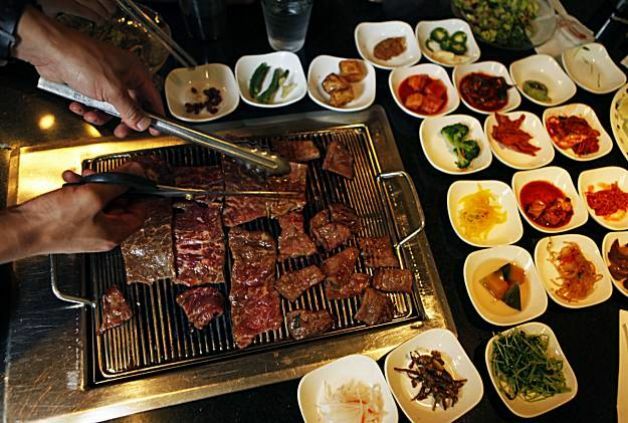 While what you may think of as, say, Burgundian food, may not be so easy to find anymore in Burgundy…what you may think of as Korean food (its BBQs, its accompanying pickled vegetables, its fermented soy sauces and pastes) is everywhere in modern Seoul. The kind of culinary radicalism that began to sweep through France, Italy, Spain and the U.S. 30 or 40 years ago is only now on the march in Korea. Unfortunately, it’s not an easy conversion in this culture. Much of it is fueled by Food-Network-style chef-worship, a trendy meretriciousness riding on a wave of K-pop inanity. Much of the “new” Korean cuisine I tasted in Seoul hadn’t yet found the key to conversion. But in the rush to find a solution, modern chefs—rather than relentlessly using the past for inspiration—are not digging into Korea’s culinary roots as deeply as they might. And that is why I was delighted to happen upon Congdu—which is not only a beacon for culinary progress in Korea, but could well point the way globally for the effective combination of old and new. As I first approached the restaurant, I began to sense its story. The taxi had dropped me off at a temporarily impassable lane—impassable because a few dozen Korean officials in medieval regalia were majestically marching in front of me. Their destination, down a walled, romantic road, was one of the five remaining royal palaces in Seoul (these buildings are maintained for the public good, despite the absence of contemporary royalty). Soon after the marchers turned into the palace gate, I found my own right turn about 100 feet ahead—the narrower, even more romantic path leading up to Congdu. If you peer beyond the twisted trees and lush greenery all around you, you can see the skyscrapers of modern Seoul in the distance. But the urban distractions are easy to ignore…as you find, unmistakably, that you are now in front of a small, charming, free-standing 15th-century building. It was built as a part of the royal palace next door—specifically as a study for the King’s mother, who wrote a book here about important values for Korean ladies to follow. The building remained a part of the palace during the long Chosun Dynasty—which had begun in 1392, and lasted until 1910—until it was converted, in 1927, post-royalty, into a radio station. The building was badly damaged during the Korean War of our own era (early 1950s), but brought back years later as a restaurant. Enter Vivian Han—a fashion and jewelry professional, who had studied and worked in New York (FIT, DKNY) and London. In her adopted cities, Han observed the explosion of other Asian cuisines—particularly Japanese—and wondered why her own cuisine, Korean, was not having the same international impact. “That set me on my course,” she told me—“to open a Korean restaurant in Seoul that would be a base for expanding global awareness of Korean cuisine.” She found her spot in 2002—the old Chosun writing studio, later radio station—and opened Congdu. Shortly thereafter, she found chef Hwan Eui Lee—a Seoul native who had attended the country’s most famous cooking school, in the southwest corner of Korea. He was back in Seoul in the early 2000s, looking for a restaurant just like Congdu. Lightning struck. Together, Han and Lee have taken monumental strides in multiple directions. “The work begins at home,” Han told me. Though she has travelled a great deal globally, Han is especially keen on traveling through her own country in search of gastronomic discoveries—everything from unknown regional dishes, to artisanal ingredients not often found in the big city. Speaking of travels through Europe and North America, Han says “many are looking for the bluebird outside the house—but the real bluebird is inside.” Indeed, a visit to Congdu, above all, should be an exploration of Korean ingredients and Korean traditional dishes. During a meeting with the chef, I was astonished by his offer of a soy sauce tasting, exhibiting Congdu’s love of all things fermented from the soy bean (the restaurant’s name actually means “beans beans”). But my astonishment grew as Lee served me five soy sauces from his favorite producer: a two-year-old sauce, a sauce from 1980, a sauce from 1970, a sauce from 1940, leading up to—believe it or not—a soy sauce from 1910! A vertical tasting of Korean soy sauces! This experience is not usually available to the diner—but Lee will occasionally pick an aged soy sauce for cooking if it has a taste just right for a special dish of the day. Intriguingly, the sauces get darker as they age—and with an increase of umami-like elements, such as bouillon, game, mushroom, iron filings, and Madeira. From the Korean display that is always on the menu, I loved the giant shrimp from Tokto (or Dokdo) Island, smoked over pine needles in traditional wood buckets, then steamed in the Korean spirit soju, which is poured over the pine needles just at the end creating great clouds of vapor. Another fascinating traditional starter is the simple-looking whole crab, from Anheung (South Korea), its meat served in spoons with rice and Korean toasted seaweed. But there is so much more here than meets the eye—involving the family recipe of their soy-sauce maker, Yoon Seondo. The preparation starts with Yoon Seondo soy sauce, which is boiled with scallion, onion, red pepper and daikon. After the sauce is chilled, whole, raw crab is placed in it to marinate (marinated raw crab, served in the shell, is a Korean tradition). It goes a step further at Congdu, however. After one day of marination, crab and sauce are separated—so that the sauce may be further reduced. After this second reduction is chilled, it is mixed with the crab again for further marinating. Then the meat and innards are removed, and served on fancy soup spoons. At this point, each diner makes a maki-like wrap with crab and rice. The rice may be ordinary, but Han has made this Korean experience super-special by serving gamtae instead of typical nori-style seaweed. “It is the finest grade of toasted seaweed,” she told me, and she’s right. The incredible texture—an improbable combination of feathers and fabric—is the perfect landing pad for this much fussed-over crab. Another fabulous traditional dish at Congdu is their rendition of japchae—one of Korea’s most famos dishes, basically a stir-fry of “glass” noodles (made from sweet potato flour). But many a japchae in my experience has been ruined by too much sweet sauce. This one, served in a crinkly Korean version of apapillote, is one of the finest, driest I’ve ever had, creating a ridiculously slippery, springy-tender texture; that it’s garnished with burdock root and abalone from Wando (renowned in Korea), doesn’t hurt. As a kind of “main” course—though in a traditional Korean dinner all dishes are served simultaneously—you might want to consider the grilled yellow corvina, a whole side of fish which has turned rather firm through salting and long-grilling. Oh, they thought of that texture situation, hundreds of years ago—and that is why the traditional accompaniment to the fish is a bowl of green tea (Bosung, in this case) that the diner mixes together with a bit of rice. For me, the intense look inward taken by Vivian Han and Hwan Eui Lee is the most stunning thing about Congdu. But it is not the only look they’re taking. “One of our goals,” Han told me, “is to try to create new dishes, new Korean ideas…based on old traditions and traditional ingredients.” It would be my hope that other modern practitioners in Seoul begin copying Congdu immediately. There’s one more element in the Han/Lee program: not looking inward, not looking forward—but looking outward, to the rest of a world that needs to know more about Korean food. Han, and Lee, and her team, have travelled the globe to spread the Korean gospel, to such far-flung destinations as Moscow, Venice, Cambodia, Milan, Los Angeles and Beijing. But it’s hard to imagine the point being made any better than it is at home, at Congdu. As you walk into the15th-century study of a forward-thinking royal Korean mother, you can feel the connection to Vivian Han—particularly as you pass the antique Chosun dynasty fermenting jars (empty for now) arranged all around the restaurant’s entrance. On my first visit, I was also greeted by a large and stylish 1930s radio, broadcasting Korean music—another connection binding past and present. …Lee has cut the beef in carpaccio-like slices, reminiscent of Italy, and topped them with flowers as well as Asian pear. Additionally, Lee chooses three vintage soy sauces to splash on the beef. Salad in a Korean restaurant? At Congdu, yes…and it’s spectacular. The cool thing is that it’s more Western than not, with a delicate assortment of lettuces that would compliment any bowl in Provence or Rome. But Lee’s Korean creativity rushes to the forefront here: the dressing is made with fresh-pressed wild sesame oil and the one interloper ‘twixt the greens is a very Korean jelly of natural dried acorns, cut into rectangles, supplying a squishy-firm texture I’ve never before experienced. Another other creative favorite of mine at Congdu is Lee’s spin on the classic Korean guk, or porridge—in this case a white-and-creamy pine nut porridge. I’d had pine-nut guk the day before in a kind of food court beneath a department store; so I was prepared to compare: Lee wins this round! His has an unusually deep pine nut flavor (perhaps created by the presence of pine nuts from Gapyung), as well as an extraordinarily fluffy creaminess (lent, no doubt, by his soy milk “espuma”). Lastly, if you’re in Korea to eat beef—as I was, to be sure—I don’t think you can do better than the cut of sirloin served by Lee at Congdu. It is served, grilled, as a whole chunk of steak, giving it a Western look. But it is dressed with vintage Korean soy sauce…as well as a marvelous, black-brown sauce made from fermented black garlic, tasting somewhere between fermented Korean bean paste and balsamic vinegar. And then there’s the pavilion upstairs. The main dining room is long, and narrow, and normally covered up by a gracious ruffled cloth. But in fair weather, at the touch of a switch, that long cloth unfurls, leaving the room exposed to the starry Korean sky. You’re not sure whether to look up or look down—but I can guarantee that at Congdu any direction is the right one. Originally posted on Forbes.com by contributor David Rosengarten.